Exquisite artisan sterling silver Shavuot table miniature, Judaica. 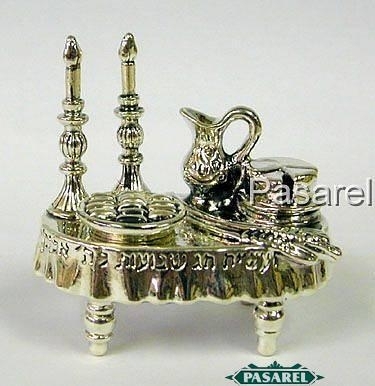 This great miniature is superbly executed as a Shavuottable, comprising a cake, pitcher, pair of candlesticks, and other Shavuot related elements. The table is inscribed on the front in H Height: 7cm. / 2.756in,. Width: 6.5cm. / 2.56in. Weight:52gr. / 1.672oz.